Earlier today we brought you the 3DS software trailer and the only reason our eyeballs didn't implode with excitement from the barrage of treats on display was because we're weren't seeing it in 3D. At just under three minutes in duration, it showed clips from twenty 3DS titles and one of them features little monkeys running around inside plastic balls. Sega has now officially announced that Super Monkey Ball for the Nintendo 3DS (working title) will be launching in early 2011. The basic premise remains the same: roll around, collect bananas and get to the goal as quickly as possible, but popular minigames Monkey Race and Monkey Fight also return. Up to four gamers can compete against each other using the wireless connection, although at this moment it isn't clear whether this will extend to online play or not. It won't just be the visuals that will be grabbing players' attention as there will be the choice of navigating the levels using the slide pad, or if you're more adventurous, the 3DS motion sensor control, with the latter sure to offer a more immersive experience. Keep an eye out for the game's webpage as it gets updated with more information. SEGA® Europe Ltd. and SEGA® of America, Inc. today announced that the legendary Super Monkey Ball series has evolved and is coming exclusively to the Nintendo 3DS™ in 2011. Developed by SEGA Studio Japan, Super Monkey Ball™ for Nintendo 3DS™* offers a whole new level of interactivity and fun, whilst completely immersing you in the world of your favourite monkeys - AiAi, MeeMee, GonGon and Baby – as they truly come alive in front of your eyes. Taking advantage of the power of the Nintendo 3DS, players can let themselves loose in each new vibrant world as they twist and turn whilst aiming to collect every banana in the fastest time possible. This latest installment contains three brand-new compelling gameplay choices including single-player puzzle levels, Monkey Race and Monkey Fight. These new game modes give players the chance to compete via wireless connection with up to four players in the best 3D social experience possible in the palm of their hands. In addition, Super Monkey Ball fans will be able to choose between the Nintendo 3DS motion sensor or the Slide Pad to navigate the puzzle mazes with complete precision. But motion controlled with the new Wii version ruined it, right? I loved SMB on GCN, so I think I'll stick with the analog slider. Yay!! 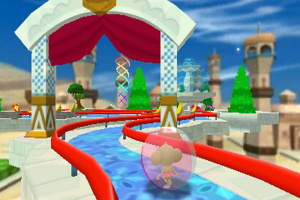 I think Monkey Ball will suit the 3DS much better than the balance board... i was quite disappointed with step & roll. Also looking forward to this one. I'll be getting this for my friend, she loves playing Monkey Ball on GCN. @JumpMad: You. Are a sick man. But I digress. I'm not much for Super Monkey Ball, so... I think I'll pass. Yay, Super Monkey Ball without weirdo controls! Oh boy Analog Control. Now all they have to do is return the style of the game into the more realistic look of the GCN games, only have the important mini games with more stages (Target, Race, Bowling, Golf, etc. ), and not have many loading times, and Super Monkey Ball will return to its former glory. I prefer the Wii Remote controls in Banana Blitz to Analog control that's for sure, although it definitly was a bit trickier at times. Haven't played Step n' Roll but I hear the Balance Board controls were pretty weak. Anyways this is definitly a day one buy for me! So how are the motion sensing controls used exactly? Hope they keep the jump in the first Wii game. Man, if they would just port 1 & 2 from the GC, I would preorder ten copies. Those games were AWESOME. The graphics on the software trailer did look very impressive.